With recreational boating accidents on the rise in Florida, officials are re-evaluating the required safety equipment. In this blog post, we will look into what boaters must absolutely have handy when out on the water. Personal flotation devices – The Florida Fish and Wildlife Conservation Commission confirms that there must be one approved Type I, II, or III PFD for each person on board. 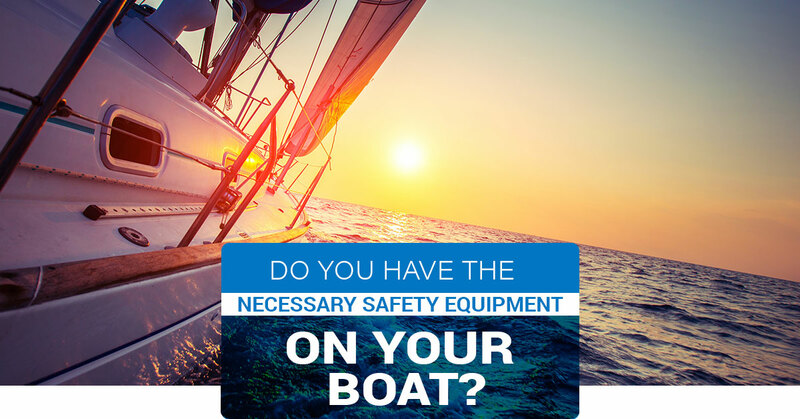 Keep in mind that each device must be USCG-approved and in serviceable condition. There must also be one throwable Type IV device. It’s important to know that every person on board under the age of 6 is required to wear an approved Type I, II, or III PFD while the vessel is underway. Fire extinguisher – Be aware that one USCG-approved B-1 type fire extinguisher is a must for all recreational motorboats aside from outboard-powered motorboats less than 26 feet long. There’s no need to be concerned with non-motorized boats here, as they are exempt from fire extinguisher requirements. Sound-producing device – Florida boaters should know that every vessel less than approximately 40 feet in length must carry some sort of sound-producing device. This could be a bell, horn, whistle, etc. There aren’t any specifications with the device, however, it must be able to produce signals required by the navigational rules. Vessel lighting – It’s required that recreational vessels display navigation lights between sunset and sunrise and during periods of reduced visibility (rain, fog, haze, etc.). Be sure to check out the U.S. Coast Guard Navigation Rules for specific lighting requirements for your watercraft. 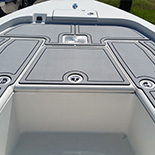 It’s never a good thing when your boat flooring is the biggest safety concern for passengers. Over time, the deck of a boat can become slick, making it anything but easy to walk around and feel comfortable. That’s where Marine Customs comes into play. 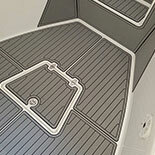 Customer focused and quality driven, we have been a marine deck fabricator and installer for years. We’re proud to say that we’ve helped countless Florida residents transform their boat in a way they never thought was possible. The process begins when our custom design consultant creates a 2D digital scan of your boat. From there, it’s imported into our CAD software where they are customized. Our clients love that they can include custom patterns, graphics, or logos. Next, the anti slip decking is fabricated on a high precision CNC machine. 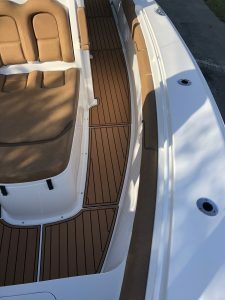 To complete the look, the marine decking is expertly installed by one of our team members. You also have the freedom to template the boat on your own. If you’re outside of our service area, you can choose one of our Template Kits. Once your completed template is received, it’s processed just as it would be in a fully customized project. Don’t compromise the safety of your passengers any longer. 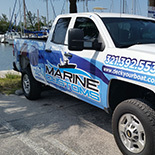 For premier marine decking in Florida, get in touch with Marine Customs.